Geeking out: With “The DM of the Ring,” the Lord of the Rings trilogy imagined as a D&D campaign. Reading: The Omnivore’s Dilemma: A Natural History of Four Meals , by Michael Pollan. Finally. What an amazing book. He’s one of those writers who can make interesting the sort of information that is usually quite dull to read. Some of his turns of phrase are just amazing. We happened to visit this place while visiting my parents (who live in the Illinois part of the St. Louis area) for a few days. But if I didn’t have family in the area, I would actually consider a trip out there anyway. This place alone merits a trip to St. Louis–it is that cool. Ok, Mike’s brother lives in Missouri. Looks like we may need to plan a trip. 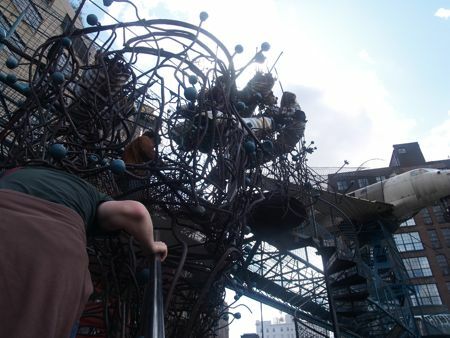 I love the City Museum. It’s the real happiest place on earth. Between my claustrophobia and fear of heights, I did more looking than crawling in things, but it was still awesome. And I don’t play D&D, but I geeked out over the thought of a LOTR campaign. That is so cool. I did a trip to St. Louis / Illinois three years ago and didn’t do anything like this. I’d love to check this out. Looks like alot of fun. @Jen: Have you looked into Lord of the Rings Online? Once your FarmTown obsession runs its course, you can get your geek on in LotRO! @Deborah: I found out about this place only because my brother told me about it. And HE just found out about it, too–from an old friend who lives in St. Louis now. That place has been around since 1997, and for some reason it totally evaded our “things to do” radar until now! We’re going to have to check that museum out. I’d heard the name of it, but not much about what the museum has. I also recommend “In Defense of Food” if you haven’t read it yet. Michael Pollan really makes you think about how our society feeds itself. @Frank: You definitely need to go there. FYI, it’s best for older kids and grownups. There’s a “Toddler Town” section (with face painting, clay work, various crafts, an indoor ball pit, some other stuff) that Sylvia really enjoyed. But at four she has feet that are still just a bit too small for climbing on most of the structures–her foot slipped through the gaps a few times. We’ll plan a return trip there in a couple of years. I like Pollan a lot, so I definitely have plans to check out his other work. Oh, there’s one more uber-cool thing I forgot to mention about the City Museum: it’s open until 1 a.m. on Fridays and Saturdays, and at 11 p.m. on those nights they turn out the lights so you can explore it with flashlights! I finally got to Omnivore’s Dilemma recently as well. Pretty thought provoking. I thought I alread knew a lot about food but wow. When you’re done reading it go and watch King Corn on Netflix. It’s a good companion to the book.